Upper left margin: After seizing the sinner, they went and conquered that city and hanged the king of that city and the realm became theirs. Lower left margin: And they sent an ambassador from another city which lay near the realm Joshua had captured; and they came clad in old garments and said, "We have come from far way, make peace with us for we do not intend war." Joshua accepted and made peace with them. And they entered to see the city. He [Joshua] said, "You have lied that you come from far away." But Joshua, who had sworn [to make peace], forgave them. 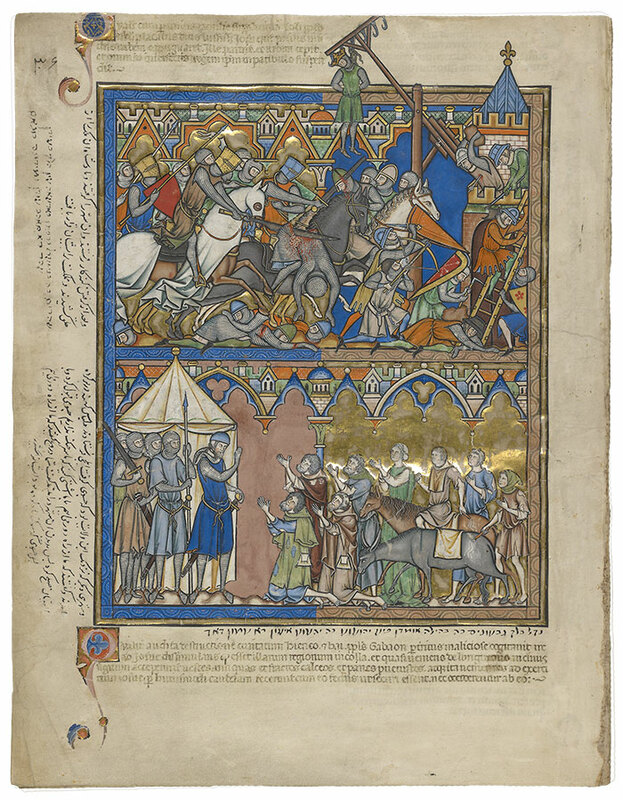 Upper left margin, furthest left: This is a town which the Children of Israel conquered, hanged its king, and became masters of the town. I don’t know where this is. Lower half, above Latin: This is the tale of the Gibeonites who came with treachery before Joshua so that Joshua would grant them safety.